a nearby opportunity for a newish and quality loom. “Thank you so much for your response. 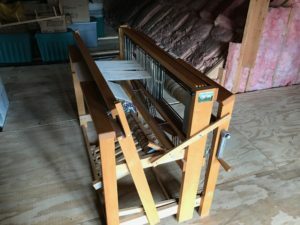 I have attached photos of the loom. admission. The sale continues Thursday and Friday from 11 to 5 and Saturday until 12:30. The sale will take place at The Federated Church Family Life Center, 16349 Chillicothe Rd., Chagrin Falls, OH 44023. I am not sure when on the 22nd the loom will arrive at the Family Life Center. It can be viewed there on Sunday, April 23rd from 11 to 4 and on Monday and Tuesday, 9 to 5, and Wednesday from 9 to noon.